We don’t actively collect stories into themed issues here at The Future Fire, but often a handful of stories and poems will cluster together in ways that feel meaningful, and timely, and even purposeful, and we can’t help but run with that serendipity (we should probably pretend that we planned it all this way, and take credit as editors for the work of the inscrutable universe). Or maybe we’re just good at seeing patterns in the random scatter of ASCII characters on our screens, as we have evolved to be. Be that as it may, the stories in this issue of TFF feel like an especially timely reflection on the turbulent, heartbreaking, terrifying, beautiful world that 2016 is leaving us with, a year in which we have lost literal genius legends like Mohammed Ali, Prince and Carrie Fisher, in which the dream of Europe is thrashing in an apnoeic nightmare, and some of us are afraid for the very survival of an intubated democracy. If you don’t want this mess of a year rubbed in your face, you can also just take this as escape into fantastic and speculative stories, some of which are also alarming and confounding, others full of beauty and hope. But we have fierce poetry, flash, short stories and novelettes, some pure gorgeous illustrations. At the shorter and longer ends, we have pieces that celebrate becoming who you really are, that advocate for choosing your own fate and bodily autonomy, and pieces that explore who gets listened to, who gets credit in the worlds of science and intellectual creation (especially timely in the month that saw the death of Vera Rubin, a legendary astronomer denied a Nobel for her invaluable work). In regular short-story length pieces, we have offerings which remind us that sometimes the world is bigger than you, weirder than you know, darker than you’d like; that the world matters more than short-term profits and human prejudices; that there are alternatives to living forever, especially when it comes to obscene concepts like corporate personhood; that we sometimes need to know when to let go, to get out of the race, to take a chance on a better alternative. All of these are lessons it’s good to be reminded of just now, whether we most of all need consolation and distraction, or whether we’re fortifying ourselves for the struggle ahead. 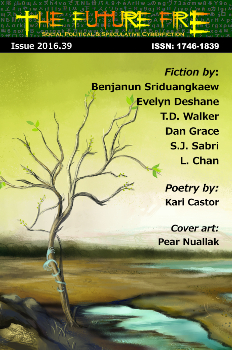 We’re especially grateful to all our authors—Benjanun, Dan, Evelyn, L., Kari, S.J. and T.D.—for sharing these wonderful works with us, especially since as Carrie Fisher reminds us in the epigraph above, writing is such a deeply personal, therapeutic, life-saving, companionable and loving activity. How wonderful that people who are able to produce powerful words like these are willing to publish them so others can share in that joy, love, fear and rescue. In the meantime I hope you’ll enjoy these stories and poems, and the illustrations by Cécile, Eric, Laura-Anca, Pear and Toeken, and that we’ll all be ready to struggle forward in 2017 as needed.